This was an extremely tight series from the beginning. In Game 1, Pierre Turgeon scored just 49 seconds into the game for the 5th-seeded ’99-’00 Blues. Then, early in the second, Brenden Morrow tied the game for the 8th-seeded ’13-’14 Blues. Then, defenseman Chris Pronger scored the eventual game-winner just 34 seconds into the third period as the ’99-’00 Blues won 2-1. The ’13-’14 Blues held a 2-1 lead after the first period of Game 2 and they took that lead into the third period. The ’99-’00 Blues scored twice in a span of seven minutes to tie the game and then take the lead with eight plus minutes left. Ryan Reaves, of all people, tied the game for the ’13-’14 Blues with about a minute and a half minute in regulation. Then, Reaves won it in overtime to tie the series almost five minutes into overtime for the 8th seed. Game 3 would also be 3-3 at the end of regulation as Pavol Demitra scored with just two seconds left in the third for the ’99-’00 Blues as they pulled their goalie for an extra attacker. The ’13-’14 Blues won it in overtime for the second straight time as Jaden Schwartz played the role of hero four and a half minutes into overtime. In Game 4, Stephane Richer opened the scoring as he gave the ’99-’00 Blues a 1-0 lead 11 plus minutes into the game and then Turgeon scored five minutes later to take a 2-0 lead. Goaltender Roman Turek would pitch a 24-save shutout for the ’99-’00 Blues as they tied the series up at two all with a 2-0 win. In Game 5, it was Ryan Miller‘s turn for a shutout as he stopped all 30 shots against as the ’13-’14 Blues blew out (lol) the 5th seed 6-0. 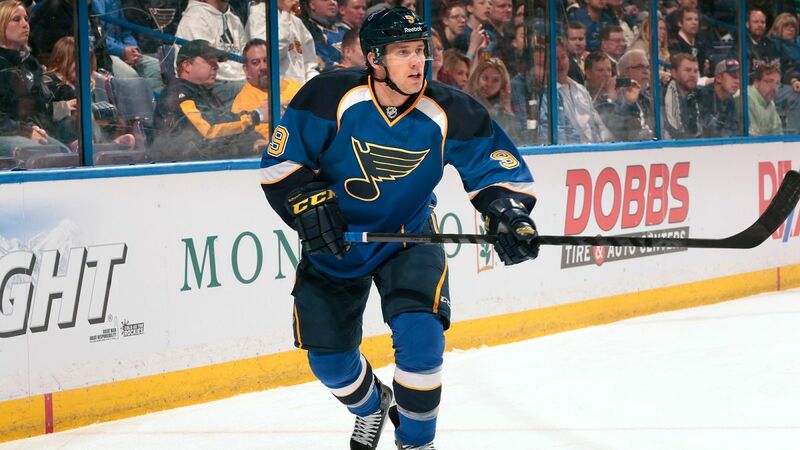 Schwartz netted a hat trick and added an assist as he lead the ’13-’14 Blues to the win while David Backes and defenseman Roman Polak both pitched in with multi-point games. Now facing elimination, the reigning representatives, the ’99-’00 Blues, scored first in Game 6 thanks to a Demitra goal 14 and a half minutes into the game. Then, in the second period, Schwartz scored less then two minutes into the period to tie the game for the ’13-’14 Blues. He then gave the ’13-’14 Blues a 2-1 lead about five and a half minutes later. Chris Stewart scored halfway through the second to give the ’13-’14 Blues a 3-1 lead and that would turn out to be the game-winner as they finished off the series with a 3-2 win. So, there will be a new Blues representative in the Ultimate NHL Playoff with the ’99-’00 Blues’ elimination. Up next in the second Semifinal is the 2nd-seeded ’69-’70 Blues and the 6th-seeded ’80-’81 Blues! This entry was posted in Qualifying Tournament, Ultimate NHL Playoff and tagged Brenden Morrow, Chris Pronger, Chris Stewart, David Backes, Jaden Schwartz, Kevin Shattenkirk, Pavol Demitra, Pierre Turgeon, Qualifying Tournament, Roman Polak, Roman Turek, Ryan Miller, Ryan Reaves, St. Louis Blues, Stephane Richer, T.J. Oshie, Ultimate NHL Playoff. Bookmark the permalink.